An open Windows 8.1 app typically fills the entire screen, hiding everything else. However, some apps can be displayed side-by-side with a function called snap. 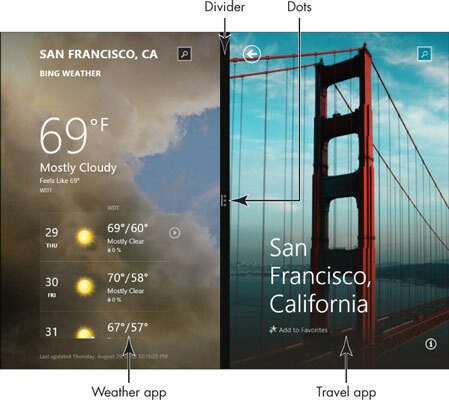 If you can’t get the two apps side-by-side, the problem may be your screen resolution, not you. The minimum screen resolution for side-by-side app display is 1366 pixels (dots) wide by 768 pixels high. If you can’t complete these steps, your screen may not support this feature. 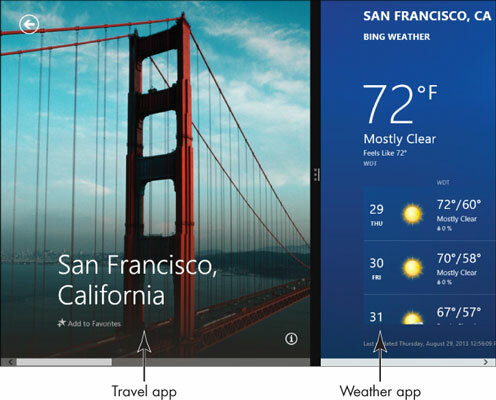 1From the Start screen, open the Weather and Travel apps, if they're not already open. Switch to the Travel app. 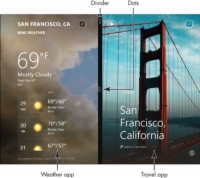 2Use one of these techniques to snap (position) the Weather app next to the Travel app. Mouse: Place the mouse pointer in the upper-left corner of the screen. 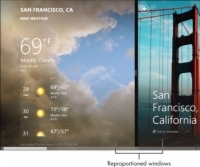 Hold down the left mouse button and drag the Weather thumbnail down until the screen splits into a narrow pane on the left for the Weather app and a wider pane on the right for Travel. Release the mouse button. Touchscreen: Swipe (press your finger down and drag) from beyond the left edge of the screen to the right. When the Weather app thumbnail appears, drag just far enough to see the screen split. A quick swipe from the left replaces one app with another. A slow swipe splits the screen. Keyboard: Press the Windows key and the period key to snap the current app to one side. Press Windows+period (.) again to snap to the other side. Use the app switcher to position the other app in the larger area of the screen. Press Windows+period a third time to restore one app to full screen. You can continue repeating this sequence until you find the screen arrangement you prefer. To snap, don’t drag the second app too far from the edge of the screen. Watch for the screen to split. 3Give the Weather app the larger share of the screen by dragging the bar between the two apps or double-clicking (double-tapping) the three dots in the middle of the bar that separates the two panes. 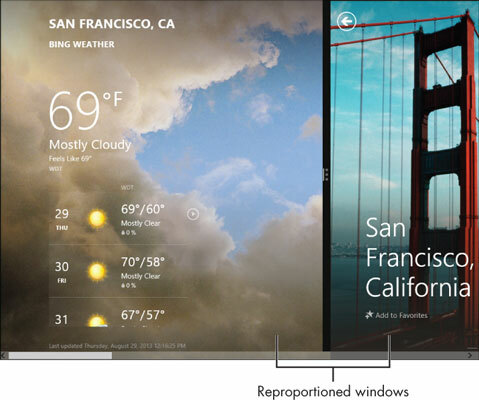 The two windows are restricted in size, roughly 25 percent to 75 percent, as shown. You can’t choose sizes in between. Apps may show different information or functions when snapped to the smaller pane. For example, when Weather is in the smaller pane, only the next few days are forecast. 4Drag the bar between panes all the way left or right to make one app full screen. You can snap more than two apps to the screen. To do so, use the same techniques you use to display an additional app onscreen (see Step 2). Whether displaying more than two apps is worthwhile depends on the size of your monitor screen. You need a wide screen to display more than two apps and be able to use them comfortably. 5If the Travel app isn't on-screen already, switch to it by using the app switcher. Place Weather on the right instead of the left by dragging the Weather app thumbnail to the right side of the screen before letting go. Now Travel is in the wide pane on the left and Weather is in the narrow pane on the right. This procedure is different than resizing the two panes, because Weather is on the right. 6Drag the bar between the panes left or right far enough to hide one app, leaving the other full screen. To avoid snapping when you don’t want two apps on screen at once, use the mouse to drag the incoming app thumbnail far enough to see its left edge. Watch how the screen changes between snap and full screen. Then let go of the thumbnail. With a touchscreen, a quick swipe or flick from the left replaces one app with another. A slow swipe splits the screen; to snap, let go when you see that split.